Regardless of your state of residence, you may not purchase notes in an amount in excess of 10% of your net worth (exclusive of the value of your home, home furnishings and automobile). It is pretty surprising that this limit exists when there are many more risky (in my opinion) investments that exist. People investing shouldn’t need to be protected from themselves. As an investor, one must accept the risks that exist. 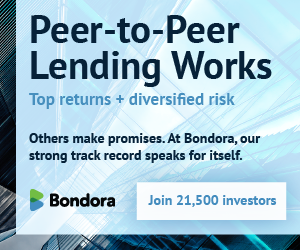 One of the first things I sense when I tell people who haven’t heard about p2p lending is apprehension. This is no surprise as it is important to ask questions, but you shouldn’t write it off p2p as far as investments go. In my opinion, the returns are too good to ignore. The fact is that no one who has invested in 800+ notes has received a negative return (source). Certainly, we can’t assume future returns based on previous ones, but it is somewhat reassuring. This paired with a large investment from Google and the possibility of LendingClub going public makes me sleep a little better at night. Being relatively young, I am comfortable at this point investing 10% of my net worth, not including an investment property. What do you invest into LendingClub? Any insights into different strategies like withdrawing principal from your account each month? Let us know in the comments!